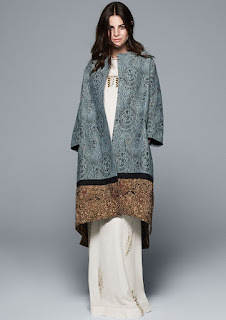 H&M 2016 Conscious Exclusive Collection effortlessly merges a sense of history with modernity. Launched to coincide with the opening of the exhibition Fashion Forward - 300 years of Fashion at the coratifs, to which it pays homage, the collection conveys an idea of painterly and sophisticated elegance. The H&M design team has delved into the museum’ collections of archival fashions in order to pick up key pieces from the last three centuries of haute couture. The result is a contemporary and artistic collection that is soulful, progressive, conscious and truly unique. The collection will be available in approximately 180 stores worldwide and online from April 7. The fluid and easy silhouette revolves around languid dresses, arty kaftans and sculpted skirts. Prints add a dash of surprise, turning dresses into trompe l'oeil paintings or sculptures. A long ball gown with a deep neckline features a marble draping print; a liquid dress is adorned with a slice of Botticelli's Three Graces. “On of my favourite pieces from the collection is the mini asymmetric dress that was inspired by a painting by Gustave Moreau. I love the mix of a conscious, sustainable fabric and an old painting. It’s great to be able to have sustainable clothes that still look red carpet-ready,” says Julia Restoin Roitfeld, the face of the campaign. Materials include organic silk, hemp, recycled linen and Tencel® blends as well as new innovative materials such as beads made from recycled glass and Denimite − a material made out of recycled worn-out denim, which H&M is the first fashion company to use. Also new for this a on’ launch of Conscious Exclusive are three wedding dresses − a feast of lightness and embellishment materialised in dreamy, draped lines, for the bride wanting to be as beautifully dressed as she is conscious. H&M will be the exclusive sponsor of the upcoming exhibition Fashion Forward - 300 years of Fashion a coratifs. Pamela Golbin is the Chief Curator of the exhibition.